A couple of weeks ago, I wrote a post commenting on a recent paper relevant for cultural evolution (Claidière et al. 2014 “How Darwinian is cultural evolution?”). The post prompted a lively and interesting discussion in the comments (thanks to everybody! ), focusing on the concept of “cultural attraction”, as presented in that paper and in previous works of Dan Sperber (see e.g. the chapter 5 in “Explaining Culture”). I thought it could have been useful to summarise here the main points of the discussion, to not let them “buried” in the comments. A few cautionary notes before starting: first, if I misinterpret something I’ll be happy to correct it; second, I need to assume that readers know what I am writing about, this is better intended as a quasi-internal minute. It seems to me that in the comments we clarified trough successive steps what attraction is not, getting closer (at least for who needed it) to a better understanding of what it is, so I will proceed here in the same fashion. First, cultural attraction is not restricted to cognitive factors. While the work in the cultural epidemiology tradition has emphasised the importance of cognitive factors in cultural dynamics (in a more than well justified opposition to the “traditional” socio-cultural anthropology of few decades ago), cognitive factors are only one of the possible factors of attraction. Second, cultural attraction is not to be equated with Boyd and Richerson’s content-based biases. As for the first point, probably nobody involved in the discussion was convinced of that, but this identification happens in the literature so it may be not useless to point it out here. As before, content biases may be factors of attraction in particular cases, but nothing more than that. Also, cultural attraction is not to be equated with Boyd and Richerson’s guided-variation. Again, the work in the cultural epidemiology tradition has emphasised the importance of constructive processes in cultural propagation, but the claim is that cultural attraction is a more general framework that covers both constructive processes and selection (various Boyd and Richerson’s biases) as a special case. Finally, cultural attraction is not cultural evolution. Mechanisms such as drift (and possibly others) are in fact mechanisms of cultural evolution, but would not fall under the umbrella of cultural attraction, so that the two cannot be considered equivalent. 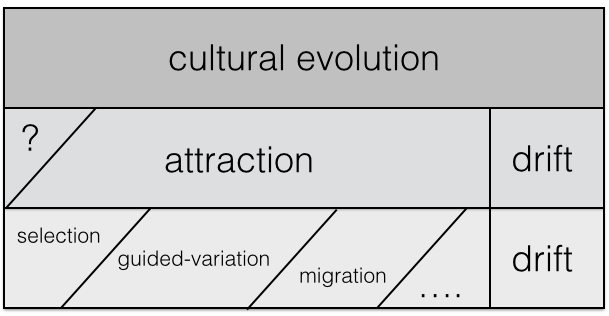 This work-in-progress schema may be of some help: cultural attraction does not overlap with cultural evolution, as random (?) forces as drift, and possibly others (question mark on the left) are not considered. On the other side, forces as selection, guided-vairation, migration, etc. can be subsumed under cultural attraction. I think Dan and Thom made a great job in explaining how exactly attraction should be related to concepts that are already present in cultural evolution and, also, there may indeed be a point in having a general concept (attraction) that “goes together with a unitary way of modelling things”. the constructive processes we discussed above may tend to transform different inputs in similar ways (rather than randomly), and in doing so cause the outputs to tendentially converge upon particular types, called attractors. This tendency is called cultural attraction. 2) Generality is surely good, but, to use again the biological case as comparison (and keeping in mind the Godfrey-Smith schema): since biologists can usually assume hi-fidelity transmission, they are in the advantage position of being less general. Thus the need for generality in cultural evolution is not good per se, but it is linked to the particular importance of non-preservative processes, which is, again, an empirical question. 3) Finally, a practical question: what should we do with the sophisticated formal models already developed for, say, selection-based processes? Would they need to be rewritten in the more general attraction terms (as the example you give in the paper), or one could – when a cultural domain is considered enough preservative, say first names – keep on using the existent models? I still think people should use the standard definition of “attractor” and “attraction” from dynamical systems theory. These mutually-contradictory attempted redefinitions of the concept from anthropologists strike me as being a source of terminological confusion.